Here are three GG Couture Nail Lacquers, each unique and beautiful in its own way. Two of them remind me of summer and with the weather we're having in Southern California (There was a high of 89 degrees today, IN JANUARY. I HATE it.) they were perfect. GG Couture Nail Lacquer has the cuuutest packaging ever. It comes with a rhinestone on top and a bow. AND they're scented. This first one is "Snowflake" and is scented with Red Apple. It's a semi-textured polish that comes off with a satin finish and I added a top coat to mine. This is four thin coats on its own. It's so elegant and pretty. I added a huge rhinestone from Born Pretty Store (Item ID 9740 #763). This second looks is "Speckled Lily" and it's a glitter top coat. I love how packed with glitter it is. It has black splatters, black circles, and hot pink and neon green/yellow hexagons. Lovve this. I added it over OPI's "Alpine Snow" and Orly's "Glowstick" and "Beach Cruiser." The third look is "California Girls" a pretty milky white polish packed with tiny black glitter and black glitter circles, and hexagon hot pink and neon green glitter. This one is my favorite out of all three. This was three thin coats on it's own topped with Seche Vite. This fourth look is "Snowflake" over OPI's "Do You Lilac Me" and OPI's "Black Onyx" topped with glitters from "Speckled Lily." I used a toothpick to place the hex glitters over the black. GG Couture Nail Lacquer has many other beautiful polishes you can purchase. 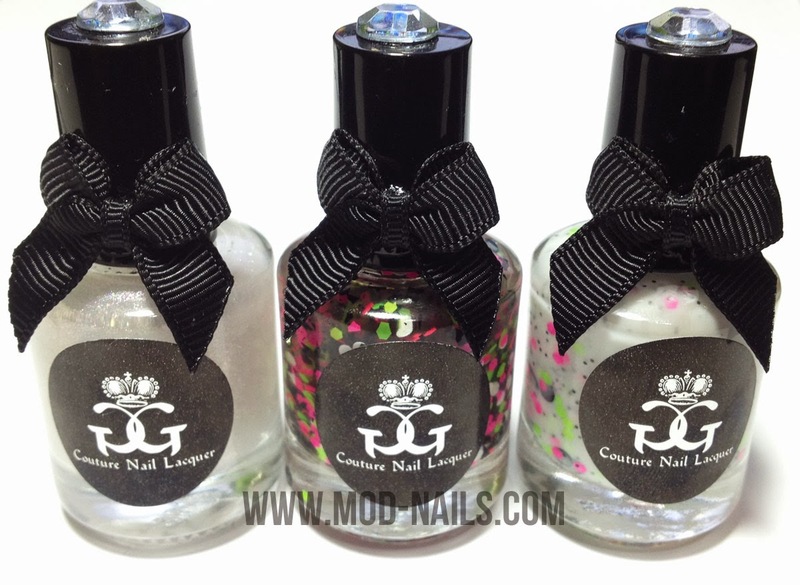 Click here for a previous post on other nail lacquers from GG Couture!